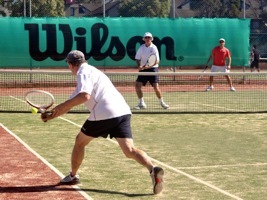 Cammeray Tennis Club, located within the Cammeray sports park on the lower North Shore of Sydney, caters for both social and competition doubles play from 1pm to 7pm each Saturday on four courts at the club. Numbers of people attending may vary between 20 and 30. Joining the club entails attending on a Saturday afternoon as a visitor for up to 3 weeks so that you and the club can be confident that the standards of play are similar. First week is free …second and third if necessary is $15 per afternoon. The cost of membership is just $165 (inc.GST) per calendar year. Members can attend all Saturday afternoon and Thursday night sessions at no further cost! Please note that due to membership fluctuations there may be periods when we are not accepting certain categories of new members. 11/2/2019: New membership opportunities for men are currently under review by the committee. Membership for women is open for applications. 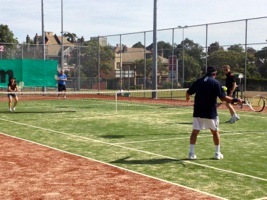 If you’re interested in joining please email us at info@cammeraytennis.asn.au. 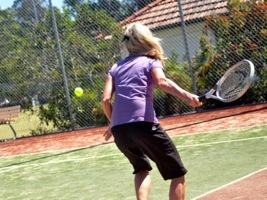 Social play is organised by Court Captains who create doubles matches trying to ensure everyone has an ENJOYABLE afternoon of tennis playing at their standard. In general no distinction is made between Guys and Gals when games are chosen….just each person’s standard of play. 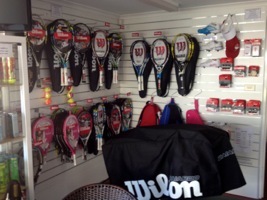 There are 2 main Doubles competitions each year organised by the NSTA (spring & autumn) that CTC enters teams for. All club members may submit their names for inclusion in CTC Teams. 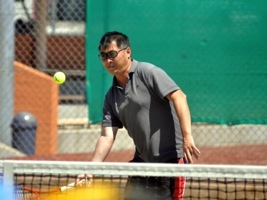 The teams are either Mixed or Men’s and the division in which a team plays is based on average grading of each team’s members. 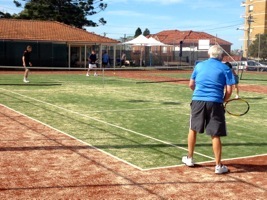 We also hold a yearly club championships (usually over a 6-8 week period in July/August/September) which include singles, open doubles, mixed doubles, and handicap doubles – all members are encouraged to take part. Afternoon tea is part of each Saturday afternoon play. These afternoon teas are provided by members on a roster basis with partial compensation of costs. The major event of the year is our Christmas Party which is either held at a local restaurant or by having a catered event at the clubhouse. Food, drink, and entertainment is provided and yearly Club Championship presentations are made. The other club subsidised yearly event is the “XMAS in JULY” dinner. Nothing formal about this , just an opportunity to gather with other club members while not dressed in tennis gear.